Horsetail is not popular among lawn enthusiasts because of its persistent nature. Also called Bottlebrush for its appearance, this herb is difficult to exterminate once established. In my opinion, this trait shows the hand of a wise Creator Who has kindly made sure that the most beneficial plants and herbs will be available in the most difficult of circumstances. 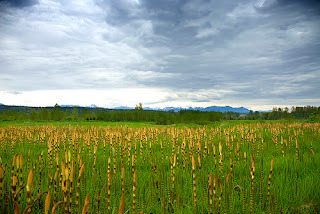 Horsetail can be found in woods, fields, meadows and swamps, and moist soils alongside streams, rivers, and lakes, and in disturbed areas; also on dry and barren sites such as roadsides, borrow pits, and railway embankments. This herb thrives in any soil but prefers damp, sandy, partially shaded areas. Shavegrass (another name for Horsetail) reproduces by means of its extensive root system. Even short segments of the rhizome will sprout. A rhizome is the creeping horizontal stem of the plant that lies just beneath the soil surface. The top of the rhizome sends up leaves; the bottom of the rhizome sends down roots. In spring, buds develop at the nodes of the rhizomes. This plant also reproduces by spores which are released from the stems and dispersed by wind or water. The spores are thin-walled, short-lived, and quickly germinate under moist conditions. Another way that Horsetail assures itself room to grow is by its high levels of alkaloids which discourage other plant growth. Bottlebrush is sensitive to drought conditions, not doing as well with less water. However even fire will only kill the top of the plant, leaving the rhizomes to reestablish themselves, usually free of the competition of other plant life destroyed by the flames. Horsetail is considered beneficial for kidney and gallbladder disorders, acting as a diuretic. This action helps to increase the production and elimination of urine, encouraging stones to flush from the system. As a vulnerary, it can be used to dissolve and discharge urinary and biliary stones. A nutritive, Horsetail contains rich stores of nutrients which help build body tissues. These are delivered in a natural balance which aids calcium absorption and helps the body retain this nutrient. 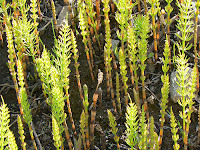 As a result of this, Horsetail is often used in herbal calcium combinations. These traits enable this herb to promote healthy skin and strengthen bone, hair, nails, and teeth. Horsetail is a beneficial in the treatment of broken bones and connective tissues. Silicon, contained in Horsetail, is an essential element in the manufacture of collagen. This gives elasticity and suppleness to the skin and contributes flexibility and strength to bones, hair and nails. Horsetail is called an internal cosmetic. Horsetail is useful in the treatment of cardiovascular disease. The combination of nutrient combined with its diuretic properties help Horsetail to enrich the blood while strengthening the heart. This herb strengthens the lungs. Bronchitis is said to be improved with its use. Good for eye, ear, nose, throat and glandular disorders. The silica in Horsetail is especially good for split ends in hair and strengthening fingernails. The tannins in Horsetail contribute to its astringent properties which tighten or contracting tissues, drying fluid secretions. The lithotriptic properties in this herb promote wound healing or normalization of damaged tissue, making it a valuable addition to poultices used to depress bleeding and accelerate healing of burns and wounds. Adding a spoon of sugar while making a decoction of Horsetail pulls more of the silicon from the plant matter into the formula. Alkaloids in Horsetail mean it is not for long-term use. Enzymes in the plant can destroy vitamin B1 stores with extended internal use. Do not use Great Horsetail (E.telmateia) or Marsh Horsetail (E. palustre), which have much higher alkaloid content. If the natural herb is used for a prolonged period, supplemental vitamin B1 (thiamine) should be taken. Be sure to drink plenty of water when taking horsetail internally to avoid the possiblity of kidney irritation.